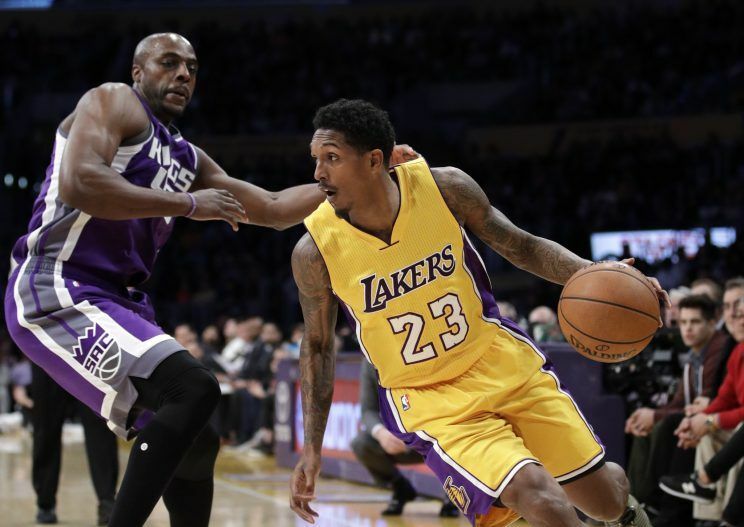 The Lakers concluded one of their most turbulent days in recent memory by trading guard Lou Williams to the Rockets for forward Corey Brewer and a 2017 first-round pick, according to Yahoo Sports and ESPN.com. After firing longtime GM Mitch Kupchak, stripping executive Jim Buss of his power, turning over the keys to Magic Johnson, and reportedly agreeing to hire super-agent Rob Pelinka as Kupchak’s replacement, LA made a move for the future by trading Williams, a strong candidate for the 2017 Sixth Man of the Year award. Williams was one of the most obvious trade chips in the league given his strong play this season, his clear fit as a leading scorer on a second unit, his reasonable contract, his playoff experience, and his utter uselessness to the Lakers, a rebuilding team that should be going all out to tank down the stretch. Really, Williams was worse than useless in LA, he was counterproductive. Every foul he drew, every four-point play he converted, and every 20-point outburst increased the chances that the Lakers don’t retain their top-3 protected first-round pick. This year, Williams is averaging a career-best 18.6 PPG and shooting a career-high 38.6% on threes, and the Lakers’ offensive efficiency rating has jumped from 98.9 to 108 when he’s been on the court. Showcasing him worked perfectly, and now it’s time for the Lakers to move forward. Cashing out on Williams accomplishes three goals: it delivers a first-round pick (which should land somewhere around No. 25), it helps the Lakes keep their own pick in a draft with major difference-makers like Markelle Fultz and UCLA’s Lonzo Ball at the top, and it opens up even more minutes and shots for 2015 lottery pick D’Angelo Russell, who hasn’t demonstrated major progress in his second season. Even though he’s still only 20, Russell (14.2 PPG, 26.5 MPG) is rapidly approaching sink-or-swim time and deserves a looser leash down the stretch of an already-lost season. This move is less about the meh return package—the Lakers added salary, Brewer doesn’t really help, and the pick isn’t anything to write home about—and more about playing the tank game. Yes, that’s always a tough sell for a high-profile franchise like the Lakers, who are stuck in their fourth straight year of abysmal losing after failing to sustain a hot start to 2016-17 that briefly raised expectations. Nevertheless, tanking is clearly the best option given that Russell hasn’t yet blossomed, Julius Randle probably isn’t going to develop into a star-level player, and 2016 lottery pick Brandon Ingram, while promising, is still a few years away from being a franchise player. As it stands, the Lakers should do everything within their power to outrace the Suns to the bottom of the West standings to capture the No. 2 spot in the draft lottery order. If that approach ultimately lands Ball, for example, the Johnson Era will be off to a strong start. The alternative universe—where the Lakers held on to Williams and put their pick into greater jeopardy than necessary—would have been an abomination. Long known as a one-way bucket-getter with a strong handle, a quick release and crafty moves, Williams looks like a logical fit in Houston. He’s comfortable playing both with the ball in his hands and as a complementary look to other stars, given his recent stint in Toronto, and his eagerness to shoot will fit right in with James Harden, Eric Gordon, Ryan Anderson and company under Rockets coach Mike D’Antoni. While the Lakers haven’t attempted nearly as many threes as the record-setting Rockets this season, the two teams have played at similar paces (both top-seven league-wide) and Williams has attempted more threes per minute than at any point during his career. Expect his green light to get even greener. Both Williams and Brewer are 30 years old but they’re trending in opposite directions: Williams is heading down the Jamal Crawford graceful aging arc while Brewer is finding it harder and harder to stay on the court. In theory, Brewer fits the Rockets’ needs better as a versatile energy guy. In practice, however, he’s struggled to contribute in a diminished role this season, posting a career-low Player Efficiency Rating. From a financial perspective, Houston actually saves a little bit of money, as Brewer was owed $15.2 million combined over this season and next while Williams will take home just $14 million. There’s zero doubt which player Houston would rather have as it gets up for a possible deep postseason run this year and looks to refine one of the league’s most potent attacks around Harden into the future. Although Houston didn’t part with much to acquire Williams, there are a few reasons to pump the brakes on the hype train. First, he’s been a far less effective player in the playoffs than in the regular season, averaging just 10.8 PPG and shooting 36.2% from the field in the postseason. Second, his defensive impact numbers have been well below average for years, making him the type of weak link who will get picked on mercilessly by teams like the Spurs and Warriors. Third, the redundancy of his skillset with Harden and Gordon will almost certainly limit the scope of his individual contributions relative to his highwater marks with the Lakers. Countering that last point, however, is the fact that Williams represents excellent injury insurance for Gordon, another Sixth Man of the Year favorite who started to miss some time before the All-Star break. The Rockets’ momentum has slowed a bit after a scoring start, and Williams is exactly the type of player who could help kick things back into gear for a top-heavy roster with grand designs on a possible trip to the Western Conference finals. HOUSTON -- The Los Angeles Lakers have agreed to trade sixth man Lou Williams to the Houston Rockets in exchange for swingman Corey Brewer and an unprotected first-round pick, sources told ESPN, confirming multiple reports. The addition of Williams brings additional scoring to the Rockets' bench, something general manager Daryl Morey said he was hoping to accomplish by Thursday's 3 p.m. ET trade deadline. The move comes on the heels of the Lakers' naming Hall of Famer Magic Johnson as their new president of basketball operations, firing longtime general manager Mitch Kupchak and removing Jim Buss as executive vice president of basketball operations. There has been some question surrounding the Lakers' decision-making process in advance of Thursday's deadline, and sources told ESPN's Ramona Shelburne that Johnson did the deal directly with Houston. The Lakers had multiple offers for Williams that included a first-round pick in recent weeks, sources told Shelburne. They were so confident in their ability to land a first-round pick for Williams that they offered that first-round pick in discussions for DeMarcus Cousins with the Sacramento Kings on Sunday. Williams is having the best season of his 12-year career, with highs in points (18.6 per game) and 3-point field goal percentage (.385). He leads the league in scoring off the bench, followed by Rockets reserve guard and newly crowned 3-point shootout champion Eric Gordon. The two have combined for 1,974 points this season. While Rockets coach Mike D'Antoni liked the defensive intangibles Brewer brought, he struggled with his shot, something the team couldn't afford to deal with in the postseason. Brewer is averaging a career-low 4.2 points per game and was held scoreless in 13 of the 58 games he has played this season. Brewer, who was informed after Tuesday's practice that he had been traded, said he was "surprised" by the move and wasn't expecting to be dealt. "If I was making shots, I would probably still be here, you never know," he said. "I love Houston. I don't want to leave, but I have no choice. I hope my shot starts falling with the Lakers." Brewer is under contract for next season at about $7.6 million. Asked about being part of Johnson's first Lakers deal, Brewer replied, "He's a great guy. It's his first trade. I guess he likes me, so we'll be good to go." Despite losing a first-round pick, Houston has two second-round picks in the 2017 draft. A source told ESPN that it is unlikely Williams will play Thursday night against the New Orleans Pelicans (and newly acquired center Cousins) because of the timing of the physical. The 30-year-old veteran guard thanked the city of Los Angeles in a tweet Tuesday evening. Magic Johnson made his first move as the Los Angeles Lakers’ president of basketball operations, trading guard Lou Williams to the Houston Rockets, league sources told The Vertical. Johnson was directly engaged with Rockets officials on the trade Tuesday afternoon and evening, league sources said. The Rockets will send a 2017 first-round pick and forward Corey Brewer to the Lakers, sources said. The pick gives the Lakers a chance to have two first-rounders in this year’s deep draft class. Williams is a significant acquisition for the Rockets, who add another superb scoring threat to their deep arsenal. Williams, 30, is averaging 18.6 points a game for the Lakers this season. He’s under contract through the 2017-18 season, earning $7 million annually. Williams, who is having a career season, had been pursued heavily by several playoff teams – including Utah and Washington – which viewed him as a potent playoff piece and worked with his agent, Wallace Prather, who eventually negotiated the deal with the Lakers. The Rockets are 40-18 and holding onto third place behind Golden State and San Antonio in the Western Conference standings. Under coach Mike D’Antoni, the Rockets have been an offensive juggernaut this season. General manager Daryl Morey has delivered superstar guard James Harden several significant new offensive weapons this season, including Eric Gordon, Ryan Anderson and now Williams. The Lakers could have two picks in the draft, but will lose their own 2017 first-rounder to the Philadelphia 76ers if it falls outside of the top three in the draft lottery. The Lakers are 19-39 on the season, near the bottom of the conference standings. Brewer, drafted No. 7 overall in 2007, is in his 10th NBA season and averaged 4.2 points for Houston in 58 games this season. Williams was drafted in the second round (No. 45 overall) by the 76ers in 2005. In 12 seasons with the 76ers, Hawks, Raptors and Lakers, Williams averaged 12.8 points, 2.9 assists and 2.1 rebounds per game. 0 Response to "Trade Grades: Lakers Conclude Turbulent Day By Trading Lou Williams To The Rockets"